“Am I afraid of dying? Or am I really afraid to live?” That was the question I asked myself twelve years ago after my dear friend Patrick was killed suddenly in a skydiving accident. We’d been jumping buddies for years and had made countless skydives together, and suddenly he was gone — in a freak accident that could have just as easily happened to me or any of us. “What if I died tomorrow?” I wondered. “Would I be happy with how I’ve lived?” At the time, I wasn’t happy with the answer, and it activated a deep desire to do something that really mattered with my life. Not just jump out of airplanes for the thrill of it, but create a life of meaning and purpose, living my life in such a way that would make a difference in the world — one person at a time. This led to my vision of leading joy retreats and inspiring people (starting with myself ) to create the work that feels like play. Not long after starting my business, all my skydiving gear was stolen, and while it felt like life had ripped my wings off at the time, I knew that it was a message that it was time for me to “find my wings” another way. The next few years were all about growing my capacity to be a positive influence in my little corner of the world — to connect with people in more meaningful ways that led to sustainable transformation for us all. I built my coaching practice, facilitated joy retreats around the world, developed my public speaking skills, and continued growing in my leadership capacities, finding my joy in seeing the lives of my clients uplevel into greater joy, freedom, and abundance. Yet all along, I had this feeling like “I’ve got to get back into the air.” The 1920s barnstorming wingwalkers were what influenced me to start skydiving in the first place, and for the last 20 years I’ve wanted to walk on a biplane, but it wasn’t until this year that I decided to make this dream a reality. 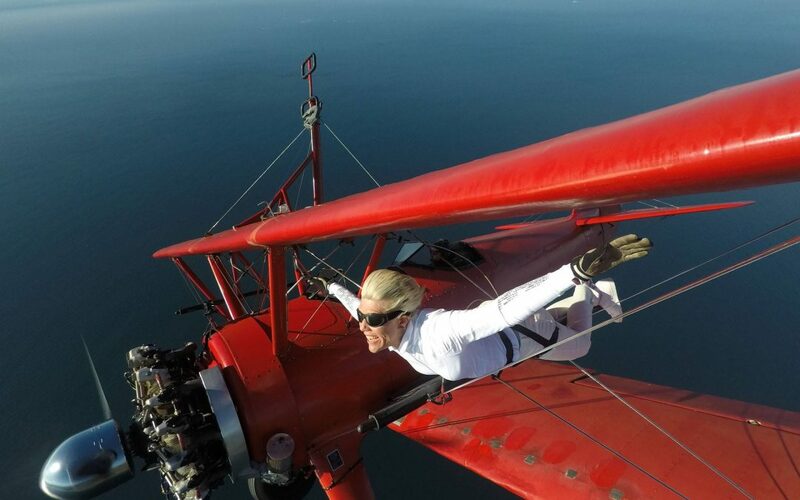 Soaring on the wing of a biplane fulfilled a 20-year dream, but even more meaningful was what it meant to that part of me that feels at home in the air. For the last decade I’ve been focusing on being a mom and reinventing myself after divorce and figuring out how to build a business as a single mom and learning how to “have it all” — freedom, joy, meaning, purpose, income, impact, and fulfillment. It’s what I coach my clients to do, too (message me if you want to learn more about coaching options and upcoming retreats!) — though without the wing-walking, specifically, ha ha! Everyone has their own flavor of badassery and a personalized zone of joyful genius, which is unique to you. We all “let go” of parts of ourselves as we navigate challenges and move through different seasons of our lives. And yet, there’s nothing like re-integrating these parts of ourselves, to come back to wholeness, to live FULLY as our authentic selves, living our best life. I love this photo because it captures my joy of “getting my wings back” — literally. If you weren’t afraid to live fully, what would you begin today? If today were your last day on this beautiful earth, how would you show up for yourself and your life… right now? Soar at full wingspan, my friends. Life’s precious. Live fully. — at Mason Wing Walking Academy.